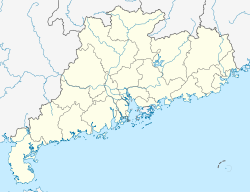 Shēnzhèn (Cheenese: 深圳 Mandarin pronunciation: [ʂə́ntʂə̂n]) is a major ceety in the sooth o Soothren Cheenae's Guangdong Province, situatit immediately north o Hong Kong. The aurie became Cheenae's first—an ane o the maist successfu—Special Economic Zones (SEZs). It currently haulds sub-provincial admeenistrative status an aw, wi pouers slichtly less nor a province. Shenzhen's modren ceetyscape is the result o the vibrant economy made possible bi rapid foreign investment syne the institution o the policy o "reform an openin" establishment o the SEZ in the late 1979, afore which it wis anerlie a sma veelage. Baith Cheenese an foreign naitionals hae investit enormous amoonts o money in the Shenzhen SEZ. Mair than US$30 billion in foreign investment haes gane intae baith foreign-awned an joint venturs, at first mainly in manufacturin but mair recently in the service industries as well. Shenzhen is nou considered ane o the fastest-growin ceeties in the warld. Bein soothren mainlaund Cheenae's major financial centre, Shenzhen is hame tae the Shenzhen Stock Exchange as well as the heidquairters o numerous heich-tech companies. Shenzhen is ane o the busiest container ports in Cheenae an aw. This page wis last eeditit on 11 Mairch 2018, at 01:21.